The Values Bus is driving coast to coast to encourage and equip voters to vote their values on November 8! 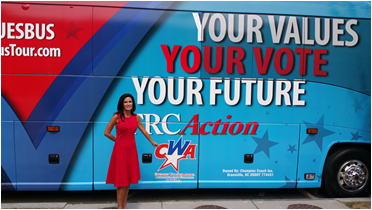 Launched by Concerned Women for America and FRC Action, the Values Bus Tour will help inform citizens in key states and communities across America. We will help mobilize America’s voters as we work together to preserve the bedrock values of religious freedom, sanctity of life, natural marriage, and limited government that make our nation strong. There is tremendous importance in the thousands of races on the ballot this year at the federal, state, and local levels. “Your Values, Your Vote, Your Future” is a fitting theme of the Values Bus as we cover over 20 states, and rally from coast to coast with Values Voters. See below for times, dates, and locations. If your location’s venue is marked “TBD,” please check back. We’ll update this list with the most current information. Venue to be decided. Stay Tuned!